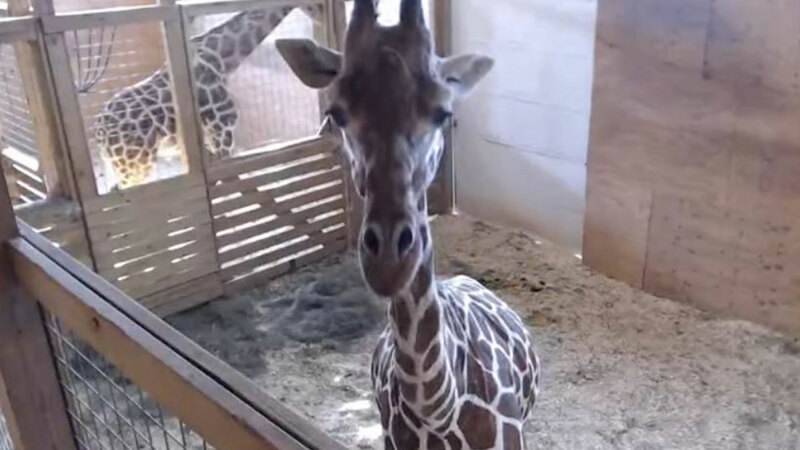 HARPURSVILLE, NY -- April the Giraffe is having a baby, and she's ready to give birth at any moment! April has been pregnant for 15 months, the normal gestation time for a giraffe. When she finally gives birth, her calf's front hooves will come out first, followed by the snout. He or she will weigh around 150lb and will stand at 6' tall. April will raise her calf naturally, and weaning could take between 6-10 months, maybe longer. Oliver, however, will not assist in raising the calf. Male giraffes, according to Animal Adventure Park, "only really care about two things- fighting and the unmentionable."